Sneaking in at the last possible moment. Once again, I actually cooked this dish weeks and weeks ago. I just haven't managed to write it up... I've been busy distracted lazy. 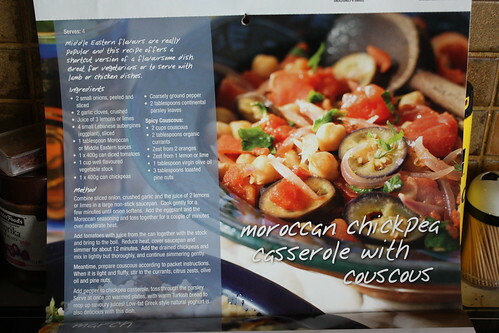 As with most casseroles, this isn't a very complicated affair. I'd like to say that I enjoyed this dish, I really really would. But I didn't. A lot of it was my fault, I must have been having an off cooking day. 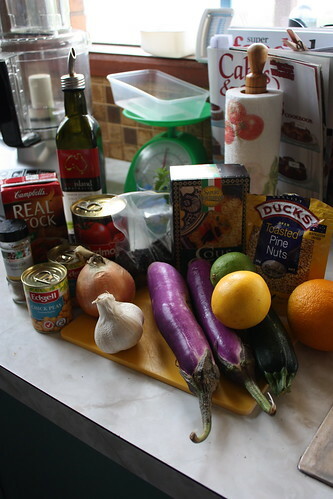 Everything could have taken longer to cook; the onions were underdone, so were the eggplants at the time of serving. It's a -very- lemoney dish and while in general I quite like lemoney things, this one was just overpowering. I think, if I were to do it again I would really sautee the onions, perhaps in olive oil first instead of in lemon juice... and really let it sit and cook longer through all the rest of the steps as well. The couscous was -delicious- and I'd definitely cook it again in a heart beat, although for this dish the extra citrus zest coupled with the lemoney casserole was overkill. Ah well, always next month! Combine onions, garlic and the juice of 2 lemons or limes in a large non-stick saucepan. 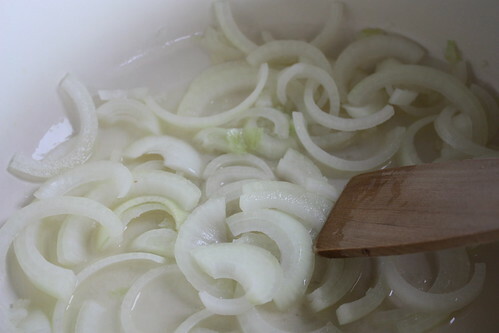 Cook gently for a few minutes until onion softens. 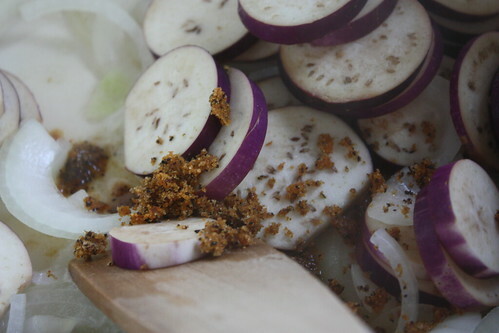 Add the eggplant and the Spice Mix and toss together for a couple of minutes over moderate heat. 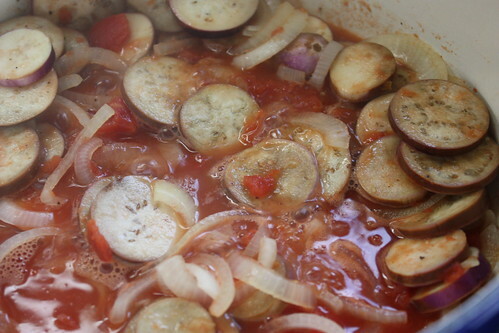 Add tomatoes with juice from the can together with the stock and bring to a boil. Reduce heat, cover saucepan and simmer for about 12 minutes. 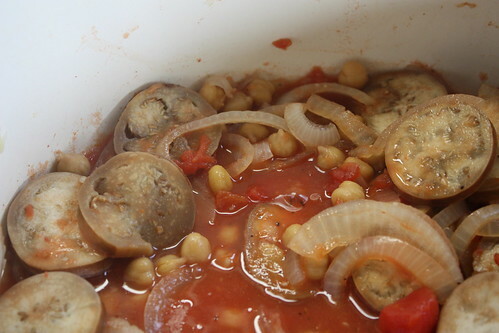 Add the drained chickpeas and mix in thoroughly, continue to simmer gently. In the meantime, prepare couscous according to packet instructions. 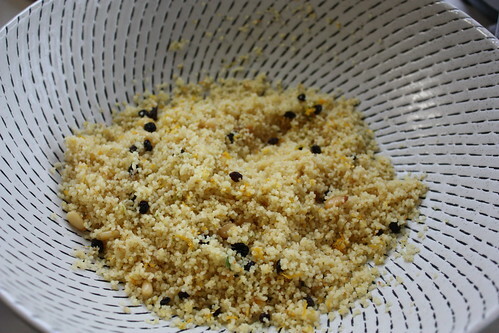 When it is light and fluffy, stir in the currants, citrus zests, olive oil and pine nuts. 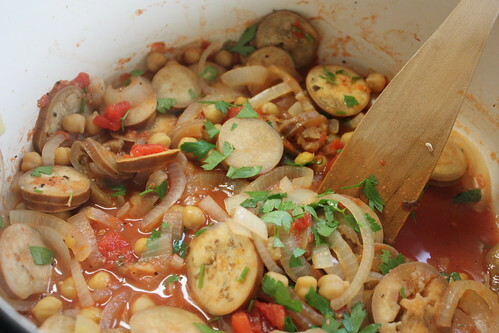 Add pepper to chickpea casserole, toss through the parsley. Serve at once on warmed plates, with warm Turkish bread to mop up savoury juices! Low-fat Greek style natural yoghurt is also delicious along with it. Oh! I forgot to mention, that I also substituted the vegetable stock with some left-over chicken stock made from scratch. We were trying to use up the rest of it. In retrospect, it was MUCH weaker in flavour then the boxed vegetable stock would have been. I think if it had been a bit more concentrate then it would have mellowed out the intense lemoney flavour as well; so make sure you use good strong vegetable stock too if you were to make this. I'd probably sub zucchini for the eggplant (just don't like it!) but this sounds DELISH. And it's pretty much pre-veganized. :D Thanks for sharing! I've got a lot to learn still about cooking eggplant (so far my only sure-fire shot of cooking it -well- is on the grill) but I do quite like them! I knew you'd like this recipe! *grins* apart from substituting the chicken broth for the stock ours was vegan... and I DEFINITELY recommend sticking with the strong veggie broth instead, would have made all the difference, I believe! 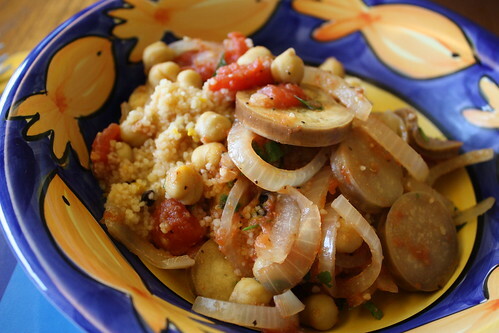 I LOVE me some chickpeas... I think I'm going to whip up a batch of this guy for next week's lunchables. :) Seems so nice and balanced. I -think- the stock would balance it out; I also think it was more the lemon couscous + lemon casserole that was a bit overkill too, so I think either a more neutral side-dish or none at all would be best. Let me know how it turns out if/when you do try though, I'd love to give this another shot sometime myself. I'm really into chickpeas at the moment too, we've been having them in most of our salads of late!